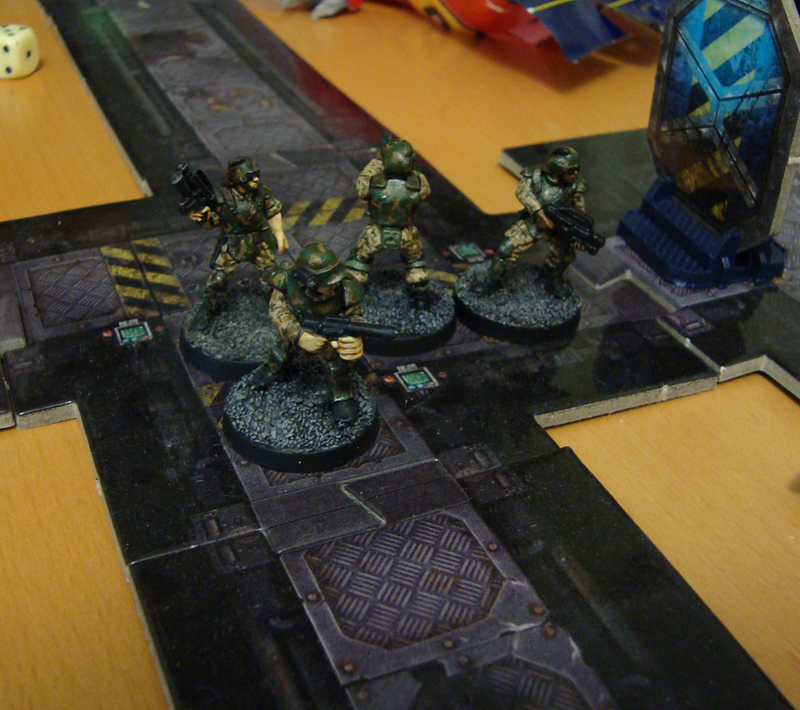 Some of you might remember me time and time again fiddling around with the idea of warpg’s – a combination of wargame and RPG. While I’ve made some forays into it, such as the one-off werewolf game and the short-lived Triton-4, I’ve never really gotten it off the ground. This just might be changing! 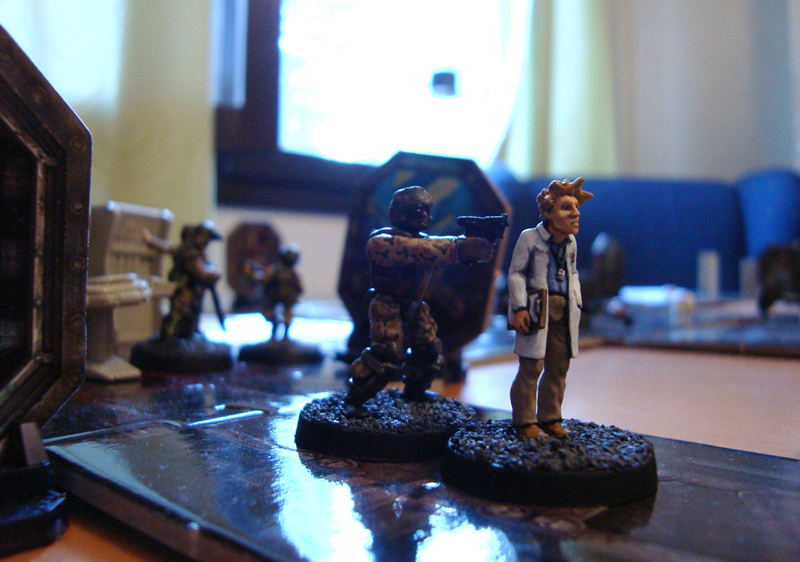 My new gaming project called Utopia (from Union of Terra Orbital Platform Insertion and Assault) took off yesterday. The game is a continuation of Triton-4, basically. There’s a game master (that’d be me) and three players, and we are using the wonderful Flying Lead system by Ganesha Games. As the name suggests, the game deals with a squad of troopers sailing around on the massive orbital platform UTP Tien Shan and getting into all sorts of interesting situations. 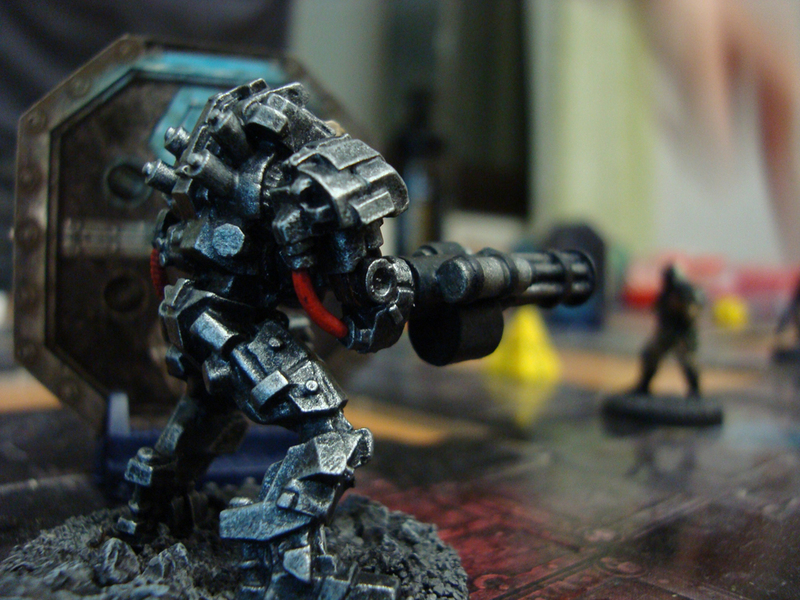 It’s 2100-something AD, and the universe is basically a mash-up of cool scifi influences (Alien, Terminator, Predator, Starship Troopers, Blade Runner, Pitch Black…to name a few), ditching strict internal consistency in favour of having fun and being able to use all the wonderful minis I’ve collected and painted during all these years. What this means is that we might have Weyland-Yutani, the Tyrell corporation and Cyberdyne Systems teaming up to create one hell of a synthetic being in order to fight the growing Arachnid menace, and so on. Canon purists will weep, we will have a great time! Sgt. 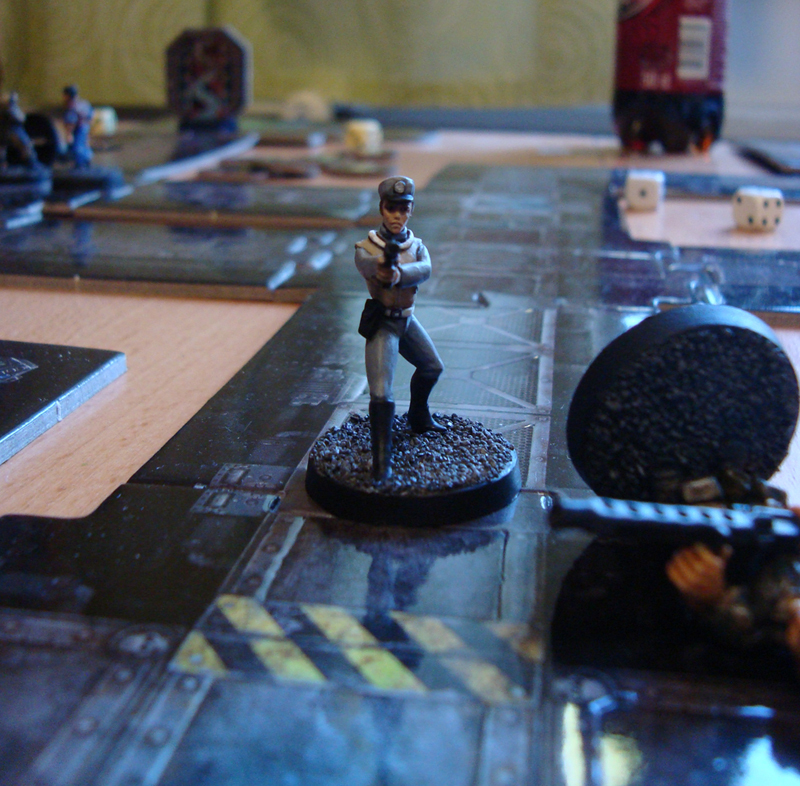 Salt Brauer, the alcoholic leader of the squad, who is weeks away from completing his tour of duty. Cpl. “Ace” Wembley, a through-and-through cynic, who also tends to take to drink to forget why she’s in the service in the first place. Pvt. Lim Evans, the highly motivated, beautiful young female medic. Pvt. Chora Haugen-Ankerson, Sgt. Brauer’s only friend who reminds him of his second ex-wife. She’s a large lady, and currently training to become an NCO. Pvt. Wu, the resident sniper from Athens. Wu has good contacts in the supply department, and can get you pretty much anything you want. Pvt. Diego “Ding” Rodriguez, who comes from a privileged family. After his father was sentenced into prison for shady financial dealing regarding orbital platforms, Diego was forced to sign up. Pvt. Bjornssen, who is a large, mild-mannered Norwegian and the squad’s tech expert. Pvt. “Dog” Lau, who’s a pretty despicable, scrawny and shady character with bad personal hygiene. He always tends to be up to his elbows in trouble over one of his schemes. Pvt. Kenny, who never made it as a professional football player. Kenny is a hulking guy, although not the sharpest pencil in the box. He wields a dreaded flame unit. Just like that, with maybe 20-30 minutes of light role-playing, we had nine personalities instead of “marine #3” and “NCO w/ shotgun”. 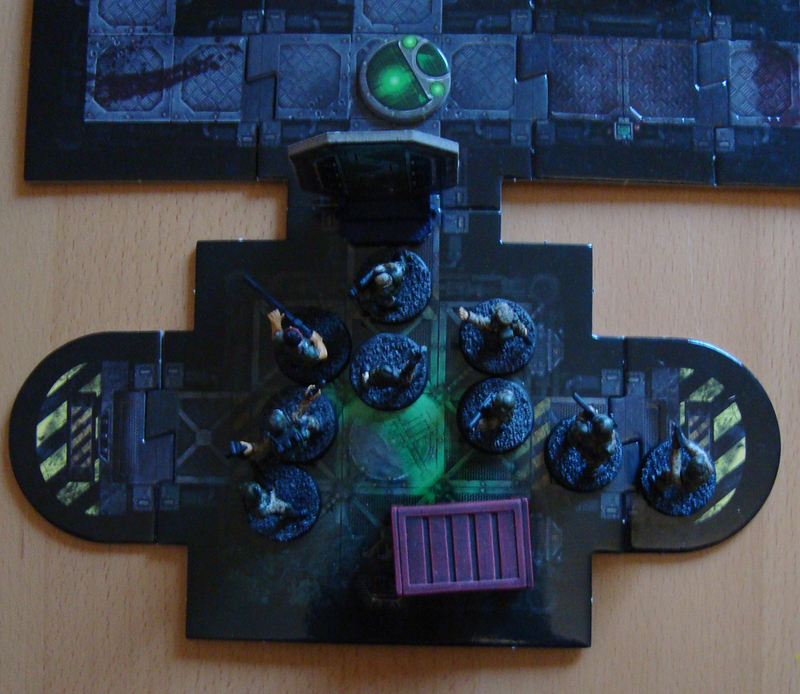 This made it much more fun to wade into the miniatures part. The first mission was set up as follows: the workers on the Alpha moon of the planet Kessler-11 had rebelled and captured the valuable refineries and mining towns. The orbital platform -based troopers would strike key locations around the moon in order to capture or eliminate the separatist leaders. 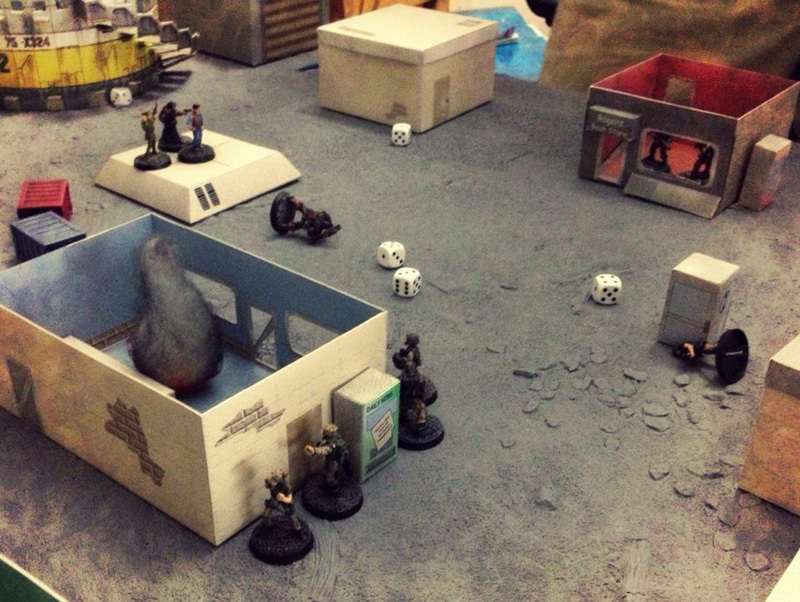 It fell to this particular squad to take the refinery town of Velasco Creek. The town had been taken over by former workers’ representative Bjarn Halmer. Halmer’s workers had received a shipment of weapons from unknown sources and overcome the local police and security forces. They had also captured Weyland-Yutani representative Eldon Burke (related). A negotiation situation had been arranged. What the rebels didn’t know was that the Union of Terra simply does not negotiate with terrorists, and had no intention of actually getting into any talks – with the exception of possibly trying to save Mr. Burke at the request of the corporation. The orders were clear: the squad was to eliminate Halmer’s men, and if possible, rescue Burke and capture Halmer alive. Pretty well, actually. The squad split into two groups. 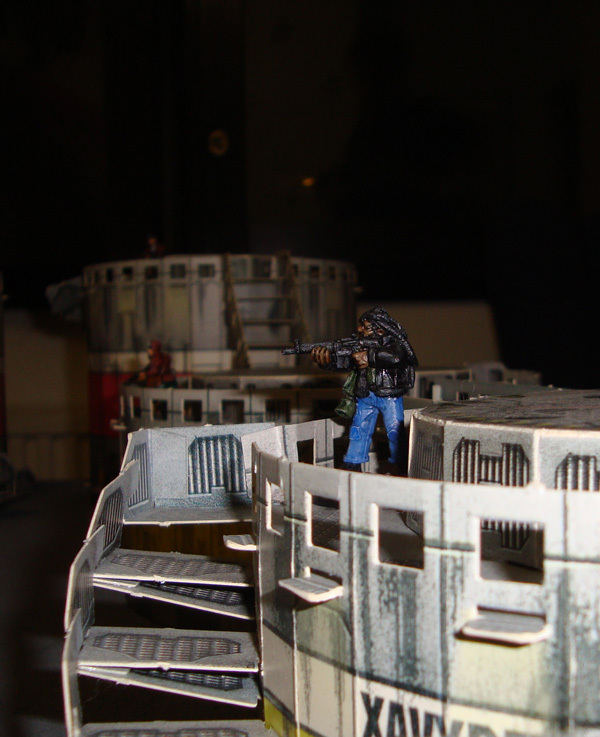 While a larger group of six moved towards the landing pad where the negotiations were to take place, a smaller group of three snuck up from behind, climbing one of the large refinery silos for a good vantage point. The large group was taking pretty long to get to the pad, so Halmer started getting suspicious and anxious. Meanwhile no-one heard Pvt. 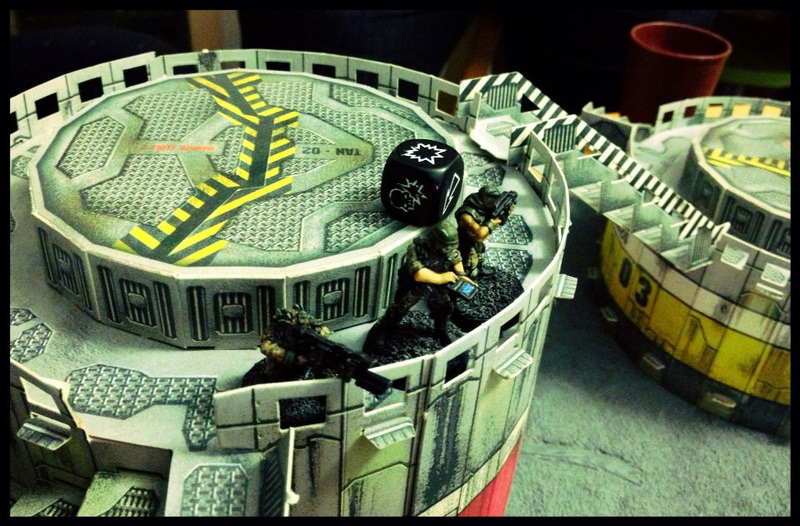 Rodriguez shove one of the rebel guards down from the top of the silo. After that things started happening pretty quickly. Pvt. Lau spotted a couple of rebels through the window of a bar. 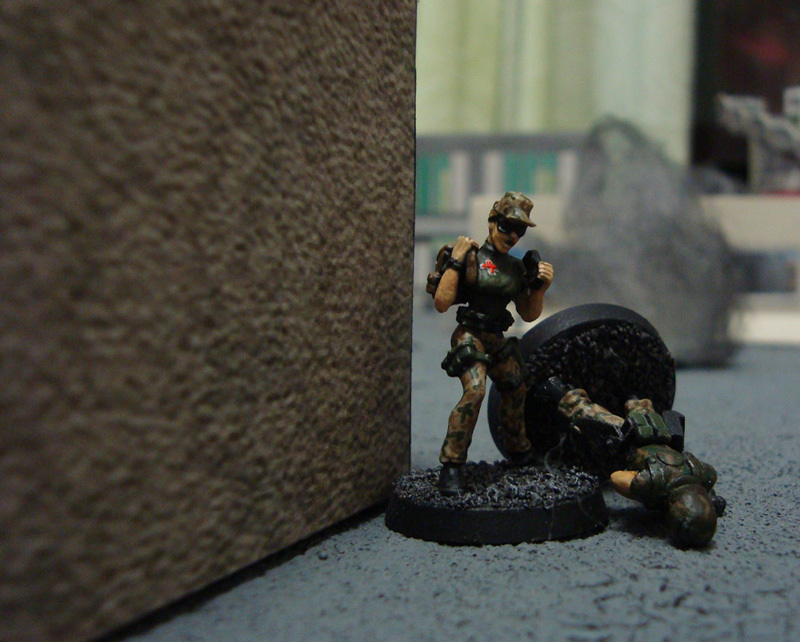 He tried to open fire but this was his first combat mission and he had forgotten to load his gun. 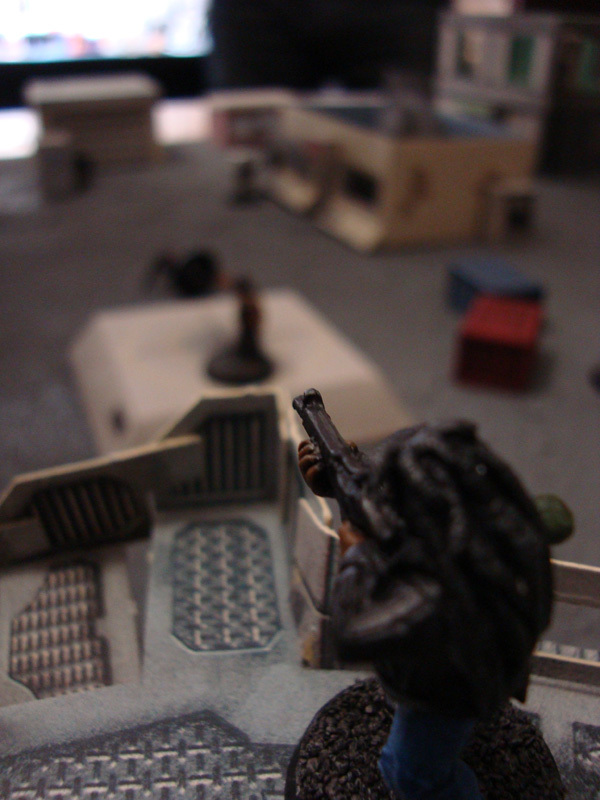 Thinking quickly he smashed the window of the bar with his rifle, allowing Pvt. Kenny to fill the interior with a nice blast of flame. A firefight erupted through the small town of Velasco Creek. 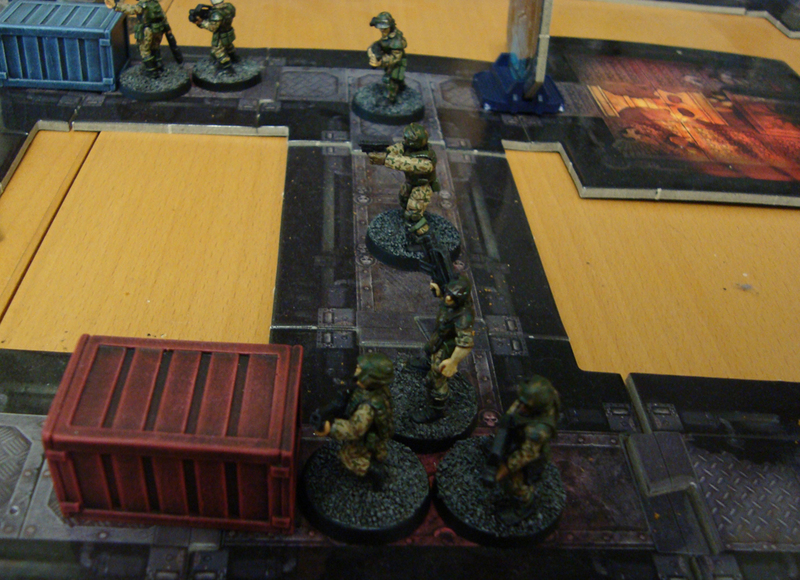 Lau and Kenny were hit by a shotgun blast, the furious rebels executed poor Eldon Burke on the spot and Halmer, not knowing that one of his guards up on the silos had been replaced by hostiles, ran right into the open and into the sniper Wu’s lethal sights. Halmer’s death led to half the rebels running away, and everything seemed to be going great for the troopers, who were bulldozing their way through the town and laying down a lot of fire. All of a sudden one of the rebels managed to actually fire back, and that’s all it took. Bjornssen, the friendly man of the fjords, was no more. 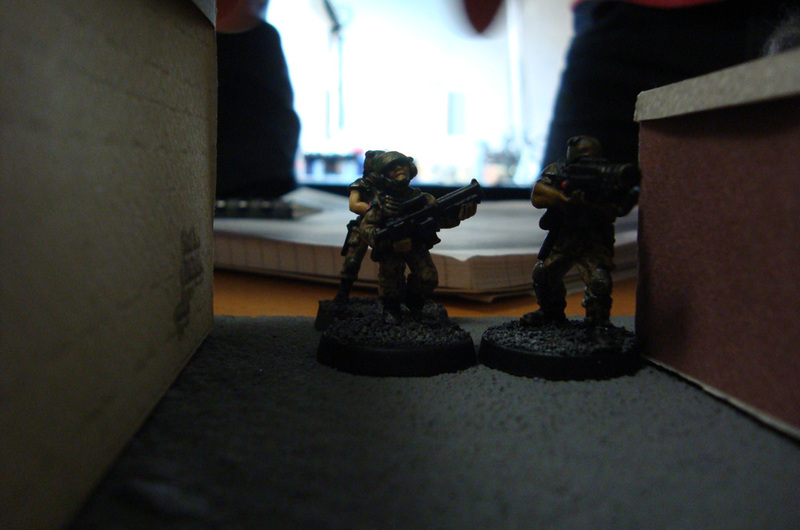 Rodriguez and Wu lost their nerve, and for a crucial moment left their vantage point. 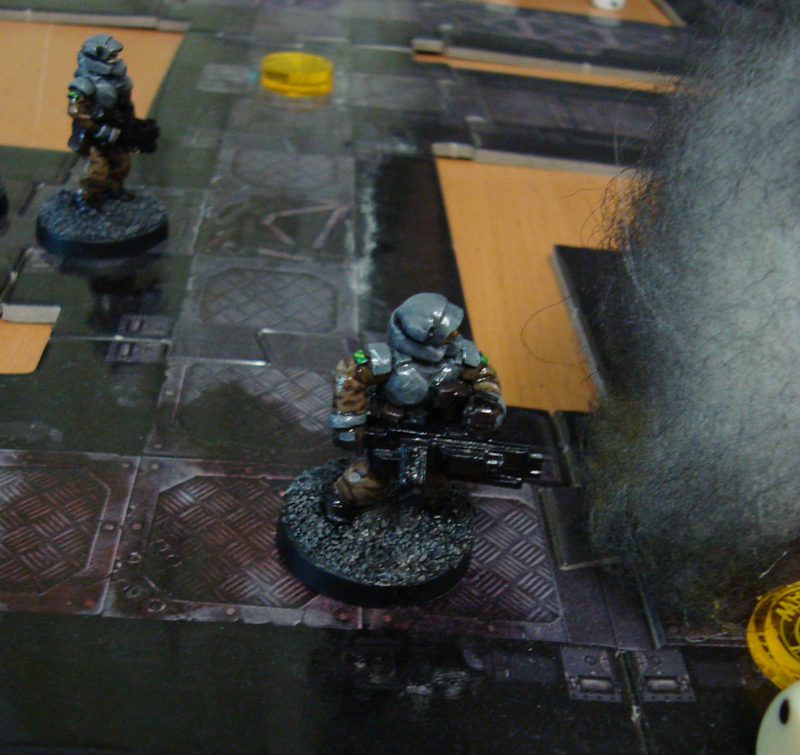 This breathed some more life into the rebels, and the remaining few got back into position to fire upon the advancing troopers. The same rebel that had killed Bjornssen took another shot and this time dropped Cpl. Wembley. By the time the squad medic got to her, Wembley was already gone. 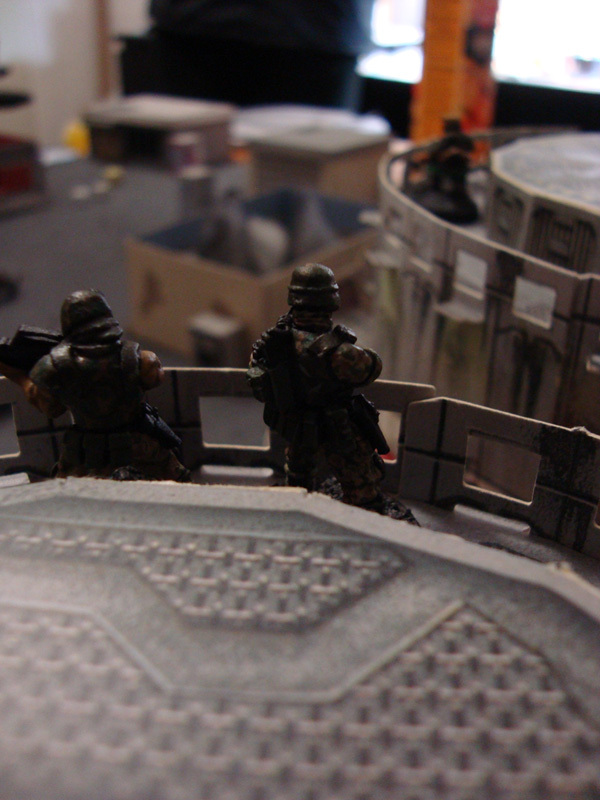 The furious troopers redoubled their efforts and mercilessly gunned down the rebels until only one remained. Despite losing two of his own, Sgt. 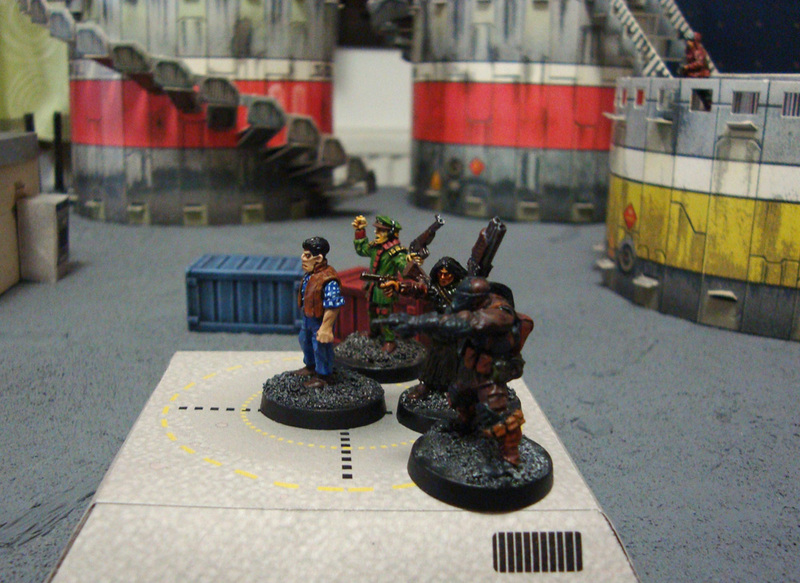 Brauer kept cool and the remaining rebel was captured for questioning. Pvt. Lau eventually survived, but would need to spend some time hospitalized. That was the game in a nutshell. 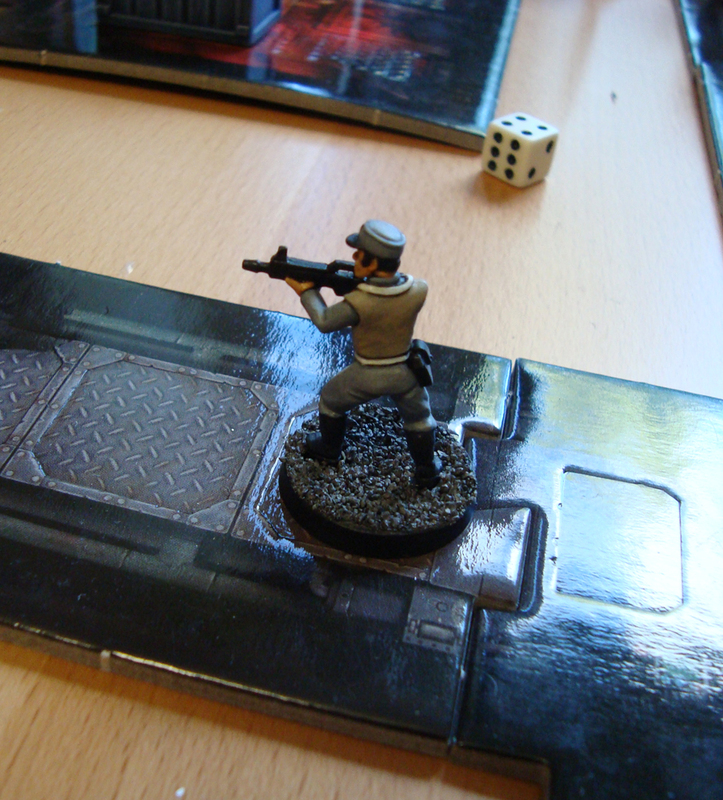 A lot of fun, great cinematic moments and improvised narrative as troopers died, flamers roared and guns jammed. A good example of the narrative way the game was handled was that no “out of ammo” result was ever just that. It was always someone having forgotten to load their gun on the dropship, or the gun jamming because of being used as a blunt instrument or something similar. 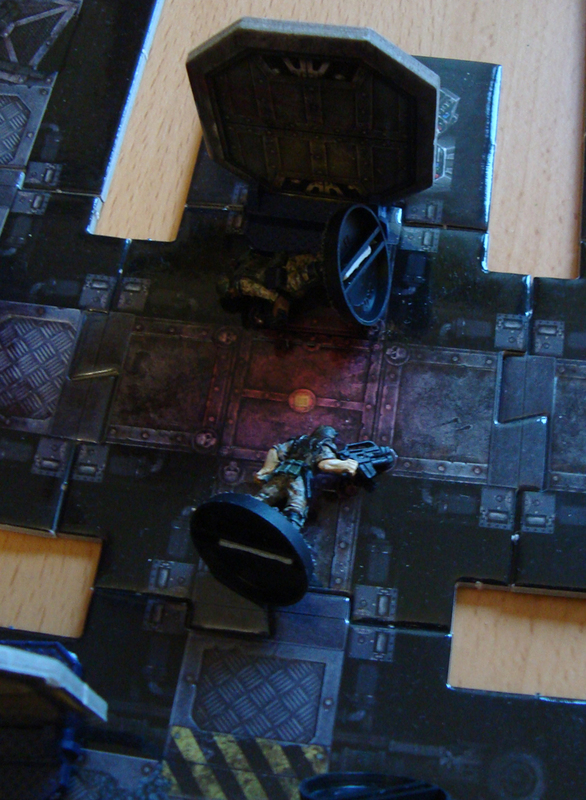 In some places narrative overruled the mechanics. 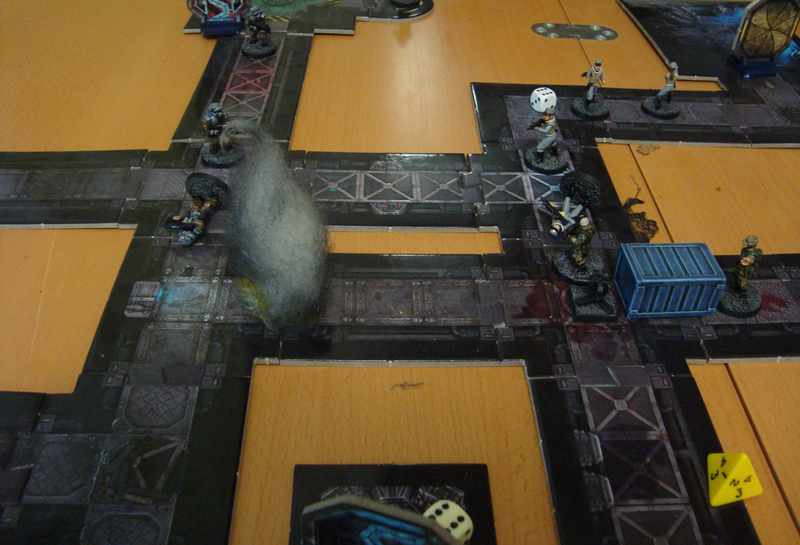 For example, in Flying Lead a model usually has to shoot at the nearest enemy. 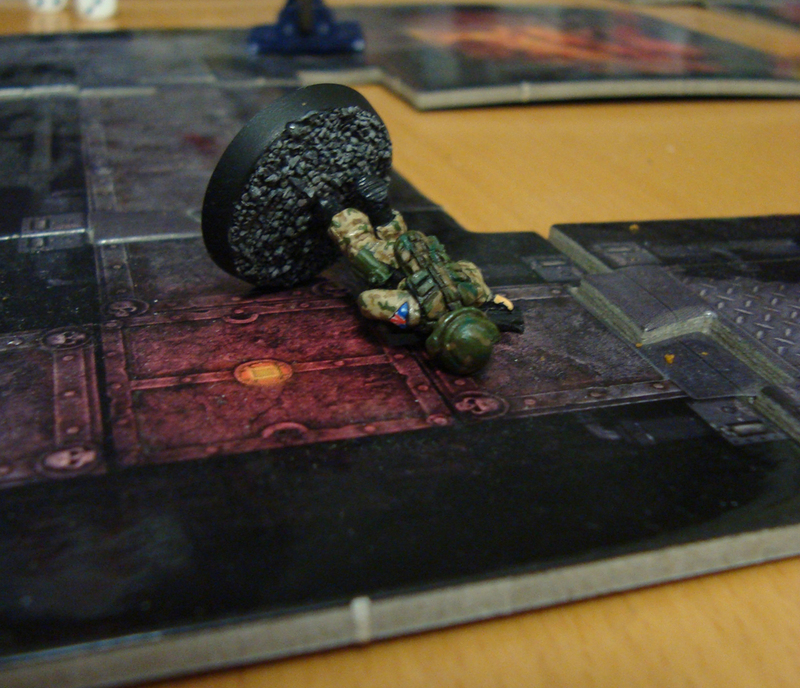 However, I made an exception to this in the case of Evans the medic. Come on, the so-called rebels were basically civilians with guns! They’re not going to shoot an unarmoured medic with large red crosses on her clothing. Then again, a particularly evil or fanatical character might have, and so on. Flying Lead is a very good system for a game like this, as it is generic and flexible enough to accommodate pretty much anything. I’m happy to report that none of the problems that we speculated on earlier cropped up. 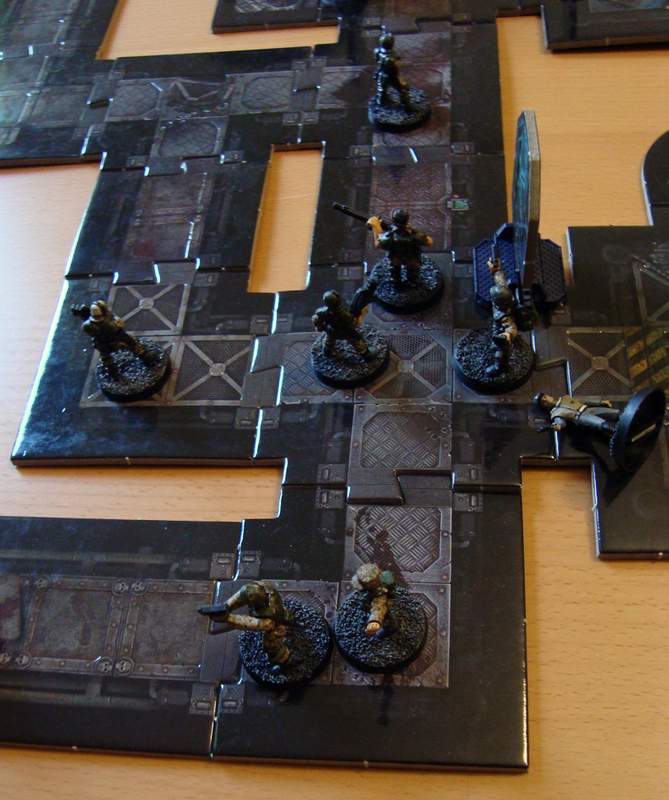 The biggest concern raised was whether the RPG aspect would hinder the tactical task of trying to win the game and vice versa. This never became an issue, and for that a huge thanks needs to go out to my three players. In addition to being experienced gamers, all three are very genre savvy, and it shows. The RPG element was a big addition to the game, and I wouldn’t hesitate to recommend it. I guess we humans are (luckily) built to relate to one another, even fictional, roughly sketched-out characters. Funny as it may seem, the deaths of Bjornssen and Wembley were far more meaningful that the deaths of two anonymous troopers. We even role-played a small memorial afterwards. It was hilariously cheezy (since everyone was well aware that we were, in fact, dealing with two wargame characters that had been created a few hours ago and would be replaced in the next session) but also weirdly touching. All in all, I’m really happy about how all this seems to be turning out. 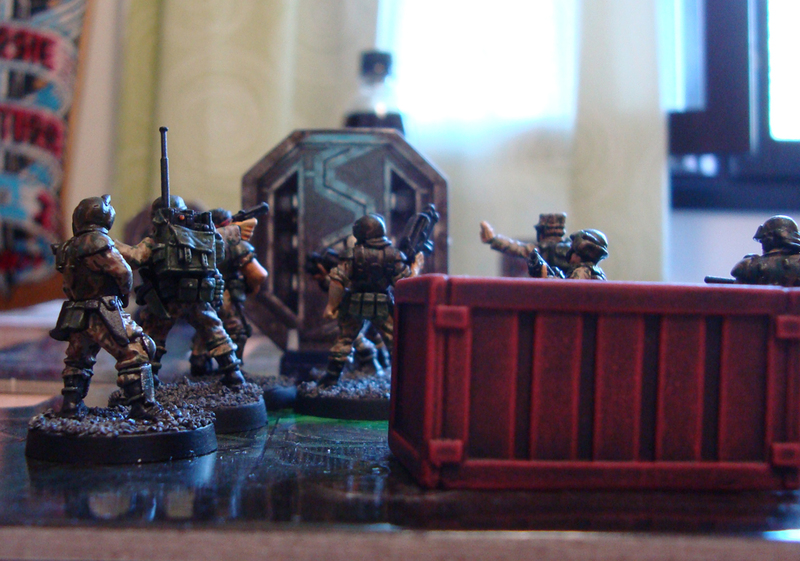 Not only am I hugely motivated to get new stuff and paint what I already have, but I’m also really into miniature gaming for the first time in a long while – Blood Bowl excluded. I’ll be sure to show off all the related projects that this one will undoubtedly spawn! Here are some pictures from the game for your viewing pleasure. 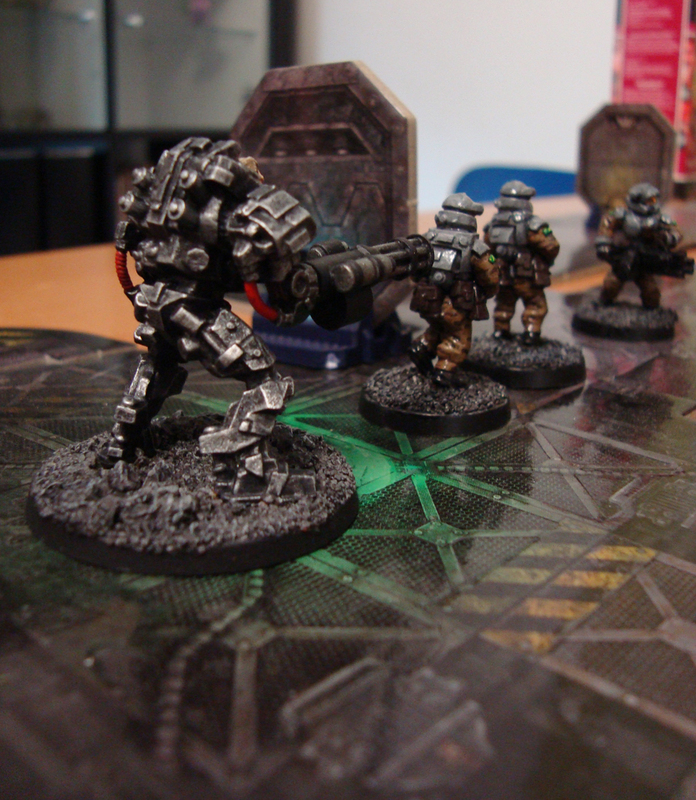 While I sadly haven’t had the time to paint my Zuzzy mat yet, it worked nicely as a barren lunar landscape. The two hipstery pics are courtesy of one of my players, Joonas. You can click on the pics for larger versions.